wratterus:I just flashed it with 3.8.2 m8 to check - same thing. So there is no nice green 'vectoring active' note on the dashboard for the DV130. If you can wait a couple of weeks I hope to be able to report back on the Mikrotik + V5311 SFP in regards to vectoring. Just waiting on @Chorusnz to flick the switch at our local ISAM. But it does not report line stats either. My cabinet, AON_G switched at 2am Tuesday. I'm near the vdsl limit for the cabinet (24.9 atten DL). The resynch remained within the normal range for my DL and UL speeds (27/3). Noticeable changes are a drop of 4 dBmV in downstream output power (now 14.4) and a change in ping from 20ms to 9ms to Spark Auckland. My cabinet, AON_G switched at 2am Monday. I'm near the vdsl limit for the cabinet (24.9 atten DL). The resynch remained within the normal range for my DL and UL speeds (27/3). Noticeable changes are a drop of 4 dBmV in downstream output power (now 14.4) and a change in ping from 20ms to 9ms to Spark Auckland. Power drop sounds like 8b to 17a. So keeping the same speed would be a positive there. 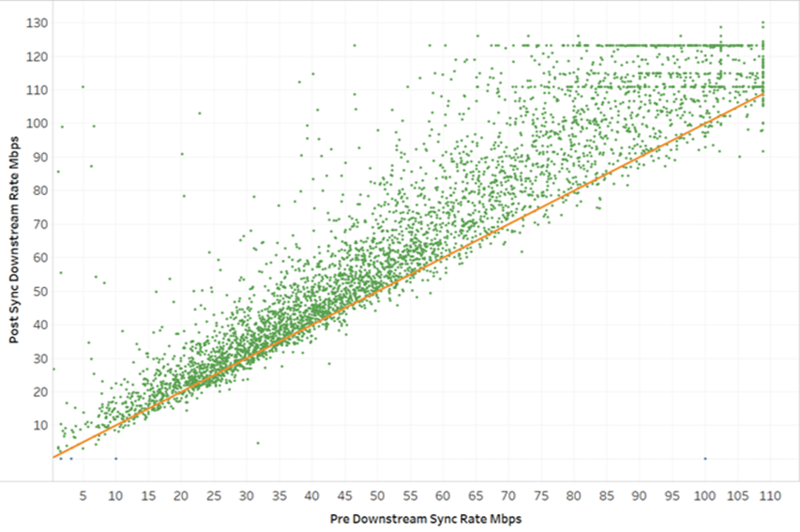 For most users on longer lines, gains in speed will be low but latency will be improved along with line stability. timmay556: Hey guys, I see that my exhange is booked in for today ( I even saw a chorus van parked outside the box on my way to work this morning) is the change over immediate or does the effect take a few days? No physical chorus man will be there, they do it remotely. It's done in the weee hours of the morning. Yeah using that map you posted. I'm on TPO\BP. Does it make much difference for us plebs on ADSL? Remember to pay attention to this graph as it's real data. lines sub about 45mbit all cluster about around where they were prior to vectoring. This means you won't really see very much gains that aren't within margin of errors. What you should gain from this is stability, reduced latency and reduced error rates. The later should result in ddDLM pushing your profile slightly faster aswell..
take my line for example, i realistically expect it to raise to maybe 25mbit. Not sure where this image came from, but please be aware that Chorus doesn't use 3 or 4. When we talk about "Legacy CPE", we are always referring to option 5. 1 is ideal, 2 is used if that's all a modem supports. retx [US] = ON, [DS] = ON. on to me and my vectoring experience..
Good news, i have G.INP now atleast! Unfortunately, the new profile seems to have a lower US0 PSD mark, this nets me a drop in upstream speed, also a bit of a dip in downstream. as for my ADSL line, this looks to have had it's earth contact returned unfortunately... So it's not really fair to comment on that, no massive changes though outside of what's expected for that fault. CydG went live this morning around 3am, Scheduled for 23:00 4 hrs earlier. I have 2 vdsl connections 1 with snapdegrees and the other with spark. 550m from a cabinet on 1980's copper. updated to modem 8 vectoring firmware. Its unlikely a reboot actually changed anything, as enabling vectoring causes a resync anyway - probably a placebo for speedtest.net typical inaccuracies. would have to be quite a fast resync? LCP timers are usually seconds, not minutes.